Time to port MSU-1 code to this, lol. This will be fun. Finally some people are getting what they wished for, two player SNES Final Fight. Keep in mind, it is still buggy. This link was left behind. @Señor Ventura Cool, I’ll check it out. @Señor Ventura Apparently, I did not have to do nothing at all. The patch is compatible with this unofficial 2p version of the game. I am testing version 6 of this hack. Soft Patching Only for the "Final Fight Guy Japan" ? Well you give the "patch.bps", or patch file whatever, the same name of the rom where the rom file is (you don't need to .zip or anything special). the Japan Final Fight Guy does not "Hard Patch" to the file, using a patch program. So I guess the emulator has to apply it during playback? That must be the only method? (I tried a regular non-msu-1 patch, but some versions of snes9x on pc don't support msu-1, i'll set this up, "soft patching" on the retropie version that does, and see if that fixes this issue. First patch the japanese headerless cody rom (Final Fight Guy (J).smc) with the msu bps patch (ffcody-jap.bps). for the two play modus. You can't patch first with the ips, because the bps is strict with the checksum. @Conn Thanks for the assistance. @psalmsamuel Unfortunately, I will not provide an official MSU-1 patch for beta software. Follow Conn’s suggested method and you will be good to go. pepillopev wrote: @psalmsamuel Please keep discussions other than “Final Fight” in the General MSU1 column. It is best to keep this topic minimal for reporting issues with the MSU1 patch itself. Anything else needs to go over there. Thanks for understanding. 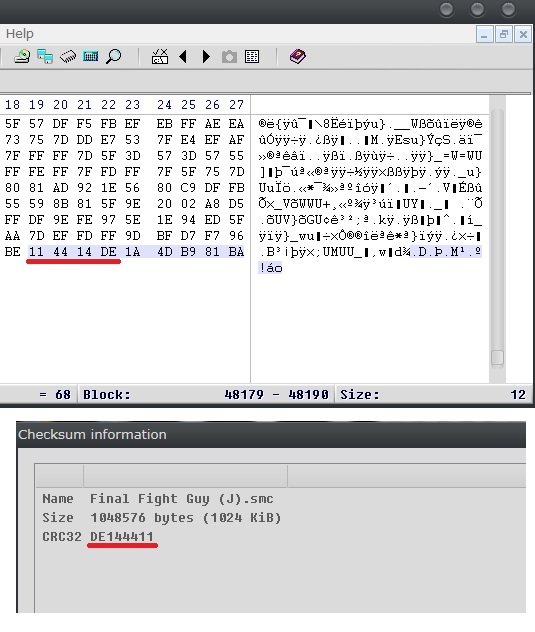 The RED BAR is the "CRC 32" checksum information, its backwards within the last 12 bytes of the patch. You have Final Fight Guy USA in view, the .bps patch in the msu-1 archive. The Information is Reported Correctly. The .bps patch for "Final Fight Guy Japan", is not reporting the correct CRC 32 value, and it has to be changed in order to patch properly, once the CRC 32 value is changed, the patch can be applied with "beat v01" patcher, it produces a working file. 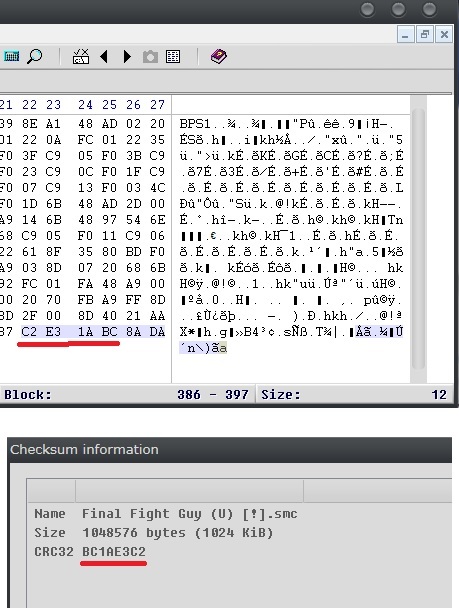 This shows the correct CRC 32 value is now in the .bps patch for "Final Fight Guy Japan". Patch Failed, but I believe this is close to the method needed to fix this particular problem. 3. (Patch Applied Okay) = "ffguy-jap"
The Isn't stated clearly in the Read Me, that you should not use the "Japan Rom of Final Fight Guy for the Japan Patch"
psalmsamuel wrote: The Isn't stated clearly in the Read Me, that you should not use the "Japan Rom of Final Fight Guy for the Japan Patch"
That is stated very clearly by Gnawtor (creator of the patch) on his webpost at this link. He clearly mentions to use the Final Fight Guy JAP ROM. My instructions in my readme are only meant for the MSU-1 patch. The name of the BPS files pretty much tell you for what ROM is meant for (common sense, no need instructions for that). As stated before, I am not supporting any issues that my MSU-1 patch may cause. I have already soft locked and crashed this game on two occasions on real hardware (using sd2snes) with the current Part6 Hack with MSU-1 applied (not stable). I have been able to reproduce it in bsnes, so far too. So you are warned. I will only support this hack once Gnawtor finishes it. So please do not bother me with MSU-1 issues if this 2p hack is used. I will simply ignore any requests to make fixes. Would not it be better to do the conversion of the SEGA CD version? @fullgamezone, I understand what your saying, I think it work work better on the sega cd, but its built off of the prototype of a snes game, So I do not think a person could convert it to the sega. Also this is rom hack that is still being worked on. @To all, I have given the hack a try, and it does a good job, but I have notice some issues with snes9x. It does bring up sprites issues and sometimes it makes the bad guys glitch at random times. So I would wait until the person has it done, so a person could study it better. @Polar Yeah, Gnawtor did explain why the sprite issues occur (2nd Player’s custom code added in is destroying native RAM values where item sprites are kept). So, it is not the emulators fault. It occurs in real hardware too. It just bugs that come with the added code. Also, this unofficial patch did not come from a prototype. Gnawtor (as well as other ROM preservationists) found out there was dormant code that gave an indication a two player feature was there at one time (still present in the released retail ROM). All he did is add the missing code back by comparing the code from Player 1. Plus many other things to long to explain here. As of now, Gnawtor has to polish the AI to target Player 2. Also on his list is fixing the introduced bugs with the added code (sprite corruption in RAM). I commend his work in improving a very criticized port. I was very impressed in everything he accomplished so far. As for FGZ’s comment. I understand his statement as wanting the Sega CD version ported to the SNES. Something I see not happening any time soon. It is like reinventing the wheel, at least to me. It is easier to work with what was already done (much of what Gnawtor is doing now with the unofficial hack). For me, I’m happy someone is improving the original Final Fight with its original ROM limitations. I had to revise my MSU1 code a bit and was able to fix the soft lock issue with the current part 6 patch. No point in releasing it since the game is in beta and Gnawtor will release part 7 patch eventually. @FullGameZone No need, the current patch works fine with minor issues. It is very playable according to psalmsamuel. I did not get the patch to run on this rom. Sorry, but what do you expect? "this patch is not intended for this Rom"
I downloaded the Final Fight ROM GUY Japan, I'm wanting to make MSU-1 final_fight_unlicensed_hack_version_PT06__use_with_final_fight_guy_japan. But no patch available is GAY JAPAN, CODY JAPAN and all others can be applied, here comes the FLIPS message "this patch is not intended for this Rom"
Applying the patch final_fight_unlicensed_hack_version_PT06__use_with_final_fight_guy_japan works normally, but I wanted to make it the MSU-1 and I'm not getting it. @fullgamezone Ok, I see your problem. I am reviewing it now. I have a feeling the patches may have been mixed up on my end, apologies if this is the case. I will fix them if there is a problem on my end and update as required. @fullgamezone No, I just checked and the BPS files from the download link are correct. Please make sure you have the correct Final Fight Guy Japan ROM (not US version). This will finally produce, the msu-1 unofficial hack for you. The video link above was just recently recorded (about 5 minutes ago or so from this post). I had no issues patching it from start to finish (as my video shows). I hope the video is better at explaining than my text version. @fullgamezone So are you ok now? yes, i need your rom !